As the Internet expands and innovation continues to soar, digital media and technology has once again brought a new horizon to the landscape of sales, marketing, and consumer interaction. These days, strategies that used to work aren’t as effective as they used to be—outbound marketing techniques relying on push tactics such as billboards, TV ads, spamming lists, and so on have been deemed “interruptive marketing.” These strategies give a voice to the brand and not the consumer, resulting in a one-way communication that allows little to no room for interaction. With inbound marketing, people can talk back and engage with the brand. They can send an email, comment on a blog, post on social media, leave a review, and engage your business in many ways. In a way, the Internet has returned power to the consumer.-So what is inbound marketing? Inbound marketing is a holistic, data-driven approach to marketing that attracts individuals to your brand and converts them into lasting customers. At its core, inbound marketing is centered around building relationships with your customers in a way that isn’t forced or annoying, but that provides real value to them in their search for a product or information. By publishing the right content in the right place, your marketing becomes relevant and helpful rather than interruptive. The kick? Inbound marketing is proven to be less expensive than traditional outbound marketing. Outbound marketing is expensive because they are usually broadcast to a mass audience even if they aren’t in your target demographics. Instead of pushing a message out onto a large population, inbound marketing attracts specific audiences that are out there looking for information. The cost per lead drops significantly for inbound marketing because online resources are significantly less expensive than mass media. You focus on a target audience that is already interested in your products, and converting them to sales results in decreased costs associated with lead generation. The methodology approach to inbound marketing comes in four phases: attract, convert, close, retain. Each phase consists of marketing tactics that self-promote your brands’ identity, and when executed properly, open doors to communicate and build relationships with clients. This way your clients aren’t just being flooded with promotions and offers for products and services but are presented the opportunity to put a face to the name and develop a relationship with your brand. This is done so by developing a unique identity that your company shares across various platforms such as social media, website pages, blogs, and anywhere your customers go to communicate with you. Direct connections with consumers not only create brand loyalty but they let you know what problems exists so you can solve them. In addition, your customers are empowered to become ambassadors for your business. When customers feel connected to a brand, they are more likely advertise their experience with that brand and recommend it to others (ultimately, free advertisement!) For this reason, it’s important to have an image your customers can connect with. Whether you’re an established firm or a small startup, inbound marketing helps propel brand loyalty and awareness, at the same time increasing lead generation and retaining client relationships. Direct connections with consumers not only create brand loyalty but they let you know what problems exists so you can solve them. 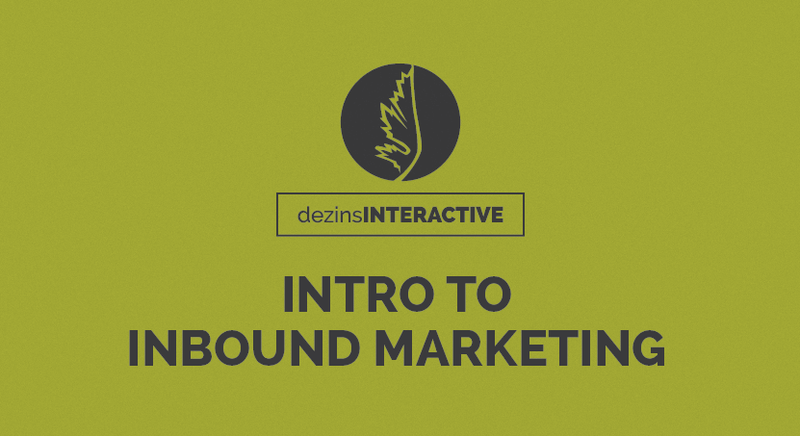 Throughout the following year, dezinsINTERACTIVE will be hosting a series of in-house seminars on Inbound Marketing. The seminar will serve as an introductory course into the vast world of inbound marketing, providing in-depth look into the difference of outbound vs. inbound, the four phases on methodology, multi-channel marketing, and much more. To learn more, visit dezinsinteractive.com/seminars.